I’m not a great lover of big cities and their suburbs. I much prefer open spaces and hilltops. But my daughter lives in Bexleyheath in south east London so of course we visit to see her and the grandchildren. There’s a large area of parkland nearby. It’s called Danson Park. I wouldn’t rate it as one of the great beauty spots of England but it does offer open space and a chance to see some wild or semi-wild life. It almost goes without saying that one of the commonest birds is the green parakeet. For people in the UK unaware of it, escapee birds have made the parks of London and surrounding areas their homes. Although they are antipodean in origin, they seem to thrive in the extra couple of degrees of warmth the city provides. Their parrot like squawks are loud enough to be heard over the ever present rumble of road traffic. Parakeets are not the only immigrant birds we find in Danson Park. In a walk around the lake I saw three species of goose and two of them originate from elsewhere. 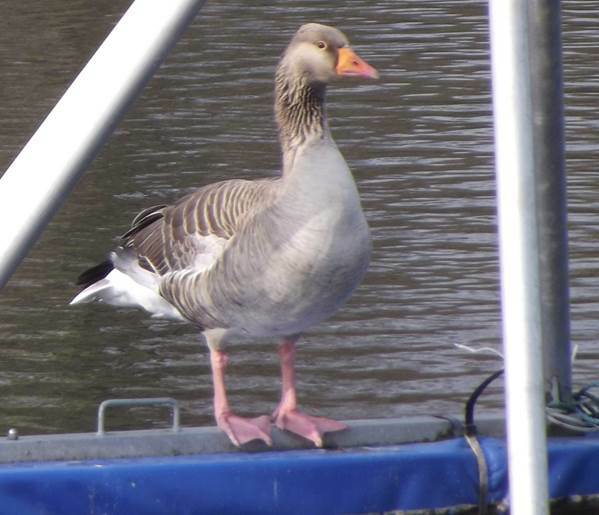 But let’s start with a goose that is native to Britain and Europe – the greylag goose, ancestor of most of the domesticated geese we might see in this country. This one, on the large, multi-function lake at Danson Park was perched on the structure of a water basketball net. In many parts of the UK it has been re-established by releasing birds in suitable areas, but the resulting flocks (often mixed with Canada geese) found around gravel pits, lakes and reservoirs all year round in southern Britain tend to be semi-tame and uninspiring. Is that bird uninspiring? I think not. I was inspired to get a photo of it. OK, the surroundings might not inspire like areas of Scotland where truly wild greylags are found, but the bird itself is still gorgeous. I like Canada geese too. It is very much an incomer from North America and was probably introduced deliberately. It spread its wings to thrive in all parts ofthe UK except the north of Scotland. Some regard it as a nuisance. But I see them as delightful. For most people, they must be the most commonly seen goose. My third goose is another incomer which, I gather, breeds in Bexleyheath. It’s an Egyptian goose. It wasn’t that close to me, being on the island in the lake. The lovely sunshine made it seem a bit of a silhouette, but I was certain I didn’t recognise it. So I set the camera to maximum zoom, pointed and pressed the shutter in the hope I could use a photo to identify the bird. It’s funny how the camera can sometimes see better than the naked eye. That’s the photo as taken but I can digitally zoom in for a blog post which only uses about 1800 pixels for the main picture. Those pale pink legs, pinkish back and large dark eye patch were the giveaways for identification. Mind you, I cheated when trying to identify it. I used google images and typed goose Danson Park. The first image was of a bird of this type – and it was far sharper and clearer than mine. Other birds on the lake included mallards, coots, moorhens, mute swans, black headed gulls and larger gulls not seen clearly enough to be certain about. It all made for a good learning experience for grandson. This entry was posted on April 25, 2015 at 5:33 am and is filed under Travel, wildlife. You can follow any responses to this entry through the RSS 2.0 feed. You can leave a response, or trackback from your own site.